Enter for your chance to win a $10,000 backyard makeover from Today’s Homeowner. 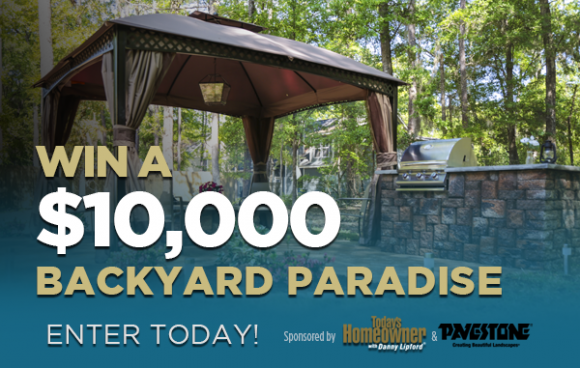 Enter the Backyard Paradise Contest from March 18 through April 14 for a chance to win up to $10,000 in Pavestone materials and labor to transform your yard into the outdoor living space of your dreams! To enter you will need to submit a brief description (not to exceed 100 words in length) of why you need a backyard paradise. You will also have the opportunity to upload/submit a photo or video pertaining to the Theme. Photo and/or video submission is an optional feature of the Contest entry. However, all photos and video submissions will be reviewed to ensure that the content is appropriate to the Contest Theme. Judging Period: April 15, 2019 through 11:59:59 p.m. ET on April 19, 2019. Judging Criteria: a qualified judge or panel of judges appointed by the Sponsor will judge based on the clear relationship between the submission and the following criteria: Originality of the overall description (50%) and Relevance to the Contest Theme (50%). Once all entries have been graded, the Sponsor will identify (up to) five (5) Contest Finalists. Each Contest Finalist may be contacted by the Sponsor with a short interview request. One (1) Grand Prize Winner will be selected from the Contest Finalists based on the judges’ scoring/ranking according to the aforementioned criteria and interview process. Official Rules: US, Canada, 21+. March 18 – April 14, 2019. One entry per person.